Everyone who knows me or has read my blog understands that I truly believe that every shot is a lucky shot. Sometimes with a lot of planning and some help you do get lucky, really lucky. In preparing to shoot the ITU World Triathlon Series Race in San Diego in April, my driver and partner in crime for the weekend, Bruno and I checked out locations, backgrounds, access and the time it would take us to get from one location to another. During the Men’s race on Saturday we knew we would miss the leaders at our first stop, they were just going too fast to make it there in time, we headed right to our second location. When the men had passed us, we move to our other spot, waited about 1 minute for their arrival, shot for less than 3 minutes and the went back to our other location. Arriving only 2 minutes later, we had already missed Ali Brownlee who was running away from the field. I spent the next two minutes shooting and headed to the finish. When I arrived at the finish the other photographers were already on the photo stand. I was the only one who had gotten out on the run course to try to get some a few shots, which I could have never done without the help and skill of my driver/partner Bruno. As luck would have it, not only did I get some cool shots, I got two cover shots, both in the span of 11 seconds! 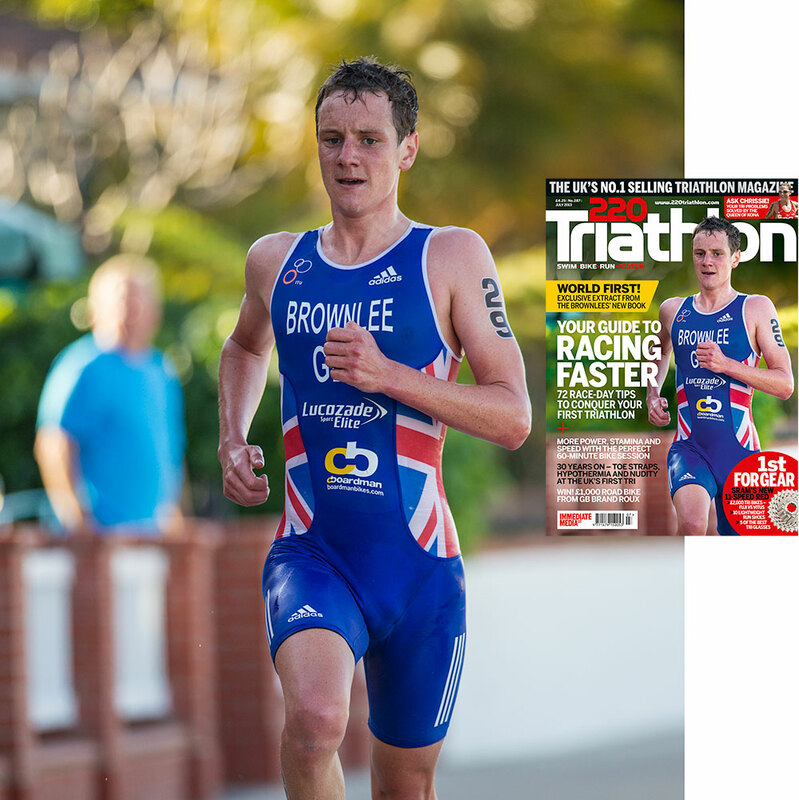 220 Triathlon Magazine – July 2013 – Issue #287 published May 28, 2013 – Olympic Gold Medalist Alistair Brownlee running away from the field. Triathlon Plus Magazine – July 2013 – Issue #55, published May 28, 2013 – South African Richard Murry running into second place. Just for good measure, here is one more that was also published on May 28, 2013! Triathlon Plus Magazine – Kona Supplement – Published May 28, 2-13. Pete Jacobs on the way back from Hawi and on his way to becoming the 2012 Ironman World Champion. One constant question about shooting sports is Shutter Priority, Aperture Priority, Manual, Automatic, or What? I don’t know that I can provide the definitive answer but I can give you a framework about how to think about your shooting. I will go on record that Automatic is NOT the right option. As the photographer, you want to make your own creative decisions. Using the Automatic / Programmed mode on any camera means that you are turning over creative control to some engineer sitting in a cubicle in Asia. Ok, it is likely a really smart engineer, but nonetheless, whoever set up the parameters of what automatic means in your camera does not have the benefit of seeing what you are seeing, nor what you are thinking just as you get ready to press the shutter! As I tell my students, friends never let friends shoot on automatic! In my last post, How To Take A Great Triathlon Photo V2013, I talked about controlling the action. In today’s post I will carry that thought quite a bit further. Don’t assume that just because I am a professional photographer that I always shoot on Manual, making an individual decision for every shot that I take. I do use manual mode on occasion but much more often I am shooting in either Shutter or Aperture Priority mode. Choosing between Shutter and Aperture Priority is really situational for me. Since the majority of shots that I am making are in a sporting environment, my go to setting is Shutter Priority. It is simple – in sports, things move and I want to control how the action is conveyed. Do I want a sharp, crisp, freeze the moment image with a high shutter speed or do I want something more fluid with a lower shutter speed? Although I do have a technical background, I try not to let the numbers drive my decision-making; thinking in terms of the visual outcome enhances my ability to capture what I am seeing inside my head (although some say there is not much up there to see). If I am not in a race mode, I often switch to Aperture priority, this may be at a pre race meeting or expo, but I set the shutter speed to what ever I know I can easily hand hold (depending on the lens). In addition, when I am out touring, I typically shoot aperture priority. As a side note, when I am out touring I typically use my 5D Mark III, since it is just a bit less conspicuous than my 1Dx. Also to discipline myself, my general rule is 1 camera, 1 lens and 1 shot at a time and every shot with intention. Even when I use Shutter Priority, it does not mean that I ignore the aperture. It means the shutter speed is my primary consideration. From there and to the extent that I want to change the depth of field, I will increase or decrease the ISO. I am sure there will be a few people reading this who are looking for numbers, so I will give you a few numbers! Let’s say it is one of my typical days shooting and I am sitting on the back of a moto. Paul’s Office – thanks to Matt Moses for the snap. I will have two camera bodies, one with my 70-200 f2.8 and the other with either the 24-70 f2.8 or a 16-35 f2.8. I also have my 300mm f2.8 over my shoulder. If I am at a Triathlon and shooting from in front (about 20 meters) of the cyclists or runners and using my 70-200 at 200mm with an aperture of f5.6, I know that my total depth of field is going to be about 3 meters, which is wide enough to get the entire bike and rider in focus and narrow enough to have it drop off pretty fast to isolate the rider. On the other hand, if I am still at the short end of that lens at 70mm, still at f5.6, I will have a total depth of field of about 40 meters. Keeping the aperture at f5.6 and grabbing the other camera with a shorter lens, if the focal length is about 50mm or less, pretty much everything is going to be in focus. I use f5.6 as sort of a target aperture, again using the 20 meter example and my 200mm lens, my depth of field at f4.5 is about 2.5 meters and at f6.3 is about 3.5 meters. This is a nice range to work in and gives flexibility as the light changes. As you can see, shooting from 20 meters away, you really have a great deal of flexibility in your aperture, just keep an eye on your ISO to make sure it doesn’t drop too low and drop your aperture, unless of course you want it to. As you get closer to the subject and your depth of field narrows, you need to pay more attention to the aperture, but still for me shutter speed is my driving consideration. Similarly when using a longer lens such as a 300 or a 400mm. As you increase the focal length of the lens, the physics dictate that the depth of field, at any given f-stop will be narrower compared to shorter lens. I have been lucky, many of my shots have been used as covers both domestically and Internationally. These are typically fairly tight shots with the athlete visually isolated – this translates to using a longer lens and low aperture. OK, I have talked enough about the concepts, let’s look at a few photos. Here is Melissa Hauschildt on her way to winning the 2013 Abu Dhabi International Triathlon. Caroline Steffen is just slightly out of the depth of field but still in the frame. I was shooting from the moto, 200 mm lens at 1/1600 and f5.6. With the spectacular background of Snow Canyon at the Ironman St. George 70.3, it would be a shame to have too narrow of a depth of field, and yet you don’t want to have it look like a bunch of cyclists rode through your landscape photo. This image is a 115 mm, 1/2000 and f6.3. Luke McKenzie leading the chase group at the Ironman St. George 70.3. Now off of the moto and laying on the side of the road with my 16 to 35, this shot of Sebastian Kienle, Ironman 70.3 World Champion was shot at 25 mm 1/1600 and f7.1 which gives almost an infinite depth of field. Off of the moto again on with some bigger glass, here is Tim O’Donnell at the 2013 Ironman San Juan 70.3. Tim was the 2 time defending champ coming back for a 3-peat, when he had a crash on the bike. Here he is in Old San Juan, shot with my 300 mm, at 1/800 and f13. With the beauty of Old San Juan, I wanted to isolate Tim, but also give some context! Due to the nature of an ITU event, I really don’t shoot that much from the moto, but it is critical to use it to get from to the best locations. With the help and skill of my moto pilot Bruno, we had the San Diego course planned out. 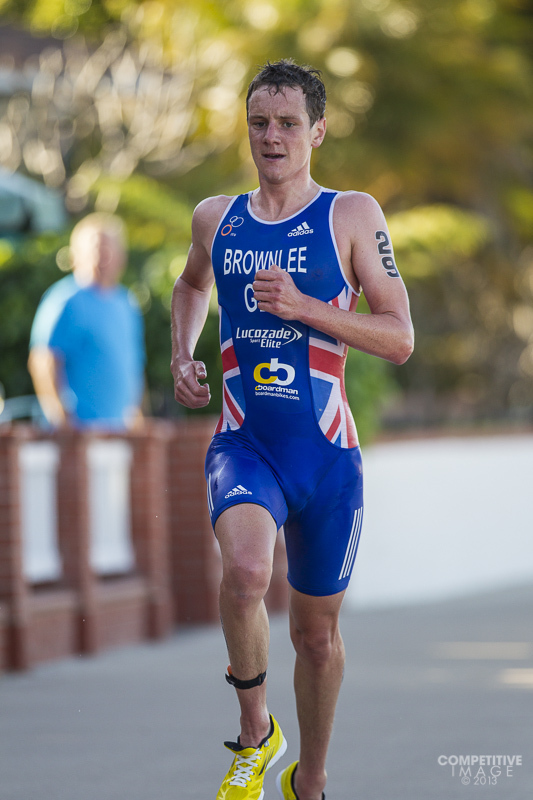 Here is Olympic Gold Medalist Alistair Brownlee in his first ITU event of 2013 running away from the field. Not much of a background here so I shot it at f2.8. Since I am off the moto, I knew I would get a really clean shot at 1/800 and I just lowered my ISO to 320 so I could get the aperture wide open. Olympic Gold Medalist Alistair Brownlee running away from the field at the 2013 World Triathlon Series race in San Diego. Running hard to catch Brownlee was South African Richard Murray, just 11 seconds later. No time to check the back of the camera or change the settings – just focus on getting the shot!